We are the world’s most comprehensive specialty components fabricator, and a leading provider of waterjet cutting services for a wide range of industries and applications. Our diversified technologies have allowed us to stay on the cutting edge of gasket & seal manufacturing. Waterjet cutting is a highly effective technique that uses high-pressure, high-velocity water forced through a small nozzle to produce a very clean, precise cut. Waterjet cutting is a fast, flexible and accurate method ideal for cutting complex parts and maintaining material integrity. One advantage of waterjet cutting is that it allows parts to be tightly nested, which maximizes yields. Waterjet technology offers accurate cuts of complex and intricate parts, efficient use of materials and less compression distortion. Another benefit of waterjet cutting is that it is an excellent method for producing prototype and test parts or short production runs. SMI proudly maintains a modern manufacturing facility with three of the most advanced waterjet cutting devices available today. Each machine deploys four independent cutting heads simultaneously. Our sales engineers guide clients through the specification process, to find the most appropriate tools and material – both performance-wise and price-wise – for your application. Our in-house capabilities mean our experts can specify, design, and manufacture everything on site, so our clients know they’re getting the right material for the functionality, as well as cost savings and exceptional quality control. 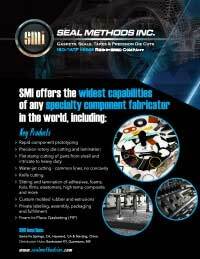 With decades of experience, 350,000 square feet of capacity, and quality certifications you can rely on, Seal Methods is an industry leader. Through process design and effects analysis, statistical control of variation, and team-oriented problem solving, we aggressively pursue improvements to our quality system and have brought our manufacturing systems to an unparalleled level of performance. Contact us here, or call 800-423-4777 to learn more.